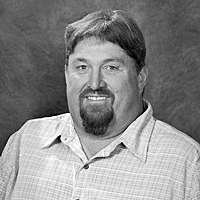 Douglas Kent Fenner, 54, of Iroquois, passed away on Wednesday, March 27, 2019, at Avera Dougherty Hospice House in Sioux Falls from a Glioblastoma brain tumor, which was diagnosed in March 2018. His Memorial Service will be on Monday, April 8, at 11 a.m. at First United Methodist Church in Huron. Visitation with the family present will be from 3-5 p.m. on Sunday, April 7, at Welter Funeral Home in Huron and one hour prior to the service at the church on Monday. A Time of Sharing will begin at 5 p.m. on Sunday, April 7, at Welter Funeral Home in Huron. Doug was born on Oct. 9, 1964, in Huron to Wendell and Bonnie (Walters) Fenner. Doug graduated from Iroquois High School in 1982 and Northern State University in 1984 with an Associate’s Degree. He followed the wheat harvest for several years as a custom harvester until his dad’s death in March of 1991 when he took over the family farm south of Iroquois. On Feb. 2, 2002, Doug married Amy Nielsen in Jamaica. Grateful for sharing his life are his wife, Amy of Iroquois; mother, Bonnie of Huron; sisters, Rhonda (Ken Dissing) Towlerton and Donna (Dr. Lee) Mabee, all of Sioux Falls; in-laws, Eudale and Helen Nielsen of Huron; many nieces and nephews; a great-nephew; and his beloved dog, Wilson. Doug was preceded in death by his father, Wendell; grandparents, Merritt and Bertha Fenner, and Albert and Margaret Walters.